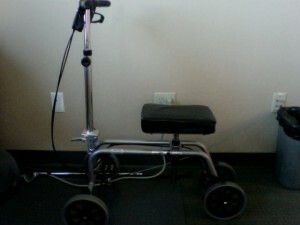 When I was in the emergency room one of the doctor’s or nurse told me about a knee scooter. So I renter once the next day and have been using it almost all the time both before and after surgery. I am able to zip around everywhere and chase down my 4 year old. Use it at work, riding around the neighborhood. My question is: Is there any harm by using this thing? Not unless you fall off! I wouldn’t use it on stairs - but otherwise looks like you could have a lot of fun with this! I tried to see if I could hire something similar in New Zealand but couldn’t find anything - perhaps there is an export opportunity!! I had a great time with mine - but I would still keep your boot/cast on in case you do fall off and need to put your foot down. Also be a little careful about your static build-up on certain surfaces or you will be giving everyone electric shocks. jonkern has completed the grueling 26.2 ATR miles to full recovery! Goal: 355 days from the surgery date.